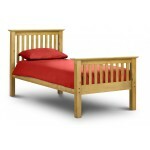 Here at 121 Home Furniture, we have a fantastic and wide selection of Childrens Beds available, supplied by one of the leading home furniture companies in the UK - Julian Bowen. 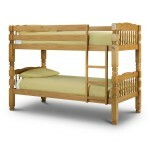 We have a wide range of Bunk Beds, Single Beds, Cabin Beds, Sleepstations, Toddler Beds, Cot Beds and Sleeper Beds in a wide range of different finishes - oak beds, white beds, metal beds, novelty beds and more. 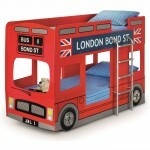 Some of our most popular childrens beds include the Domino Bunk Bed, Kimbo Cabin Bed, Stella Low Sleeper Bed, Scorpion Racer Bed, Barcelona Sleepstation and the Cameo Sleepstation. 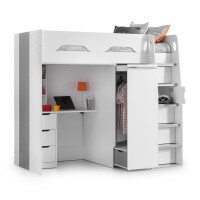 The Barcelona Sleepstaion feature ample amounts of storage with built in chest of drawers, shelves and wardrobes whereas something like the Domino Bunk Bed provides a gorgeous looking bed perfect for rooms with limited space - We have kids beds that will suit all environments. Bunk Beds - Julian Bowen Ellie Bunk Bed ELL101The Ellie is a stunning All White Bunk Bed that is sure to suit any child's bedroom. 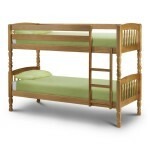 Fun yet functionalConforms to BS EN 747:2012 Safety StandardsAge Rang..
Bunk Beds - Julian Bowen Lincoln Bunk Bed UP101155 in PineSolid pine bunk bed with turned spindles in an antique lacquered finish. 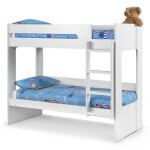 Width: 102cm	Depth: 202cm	Height: 156cmDistance be..
Domino Maple Bunk Bed with two Premier Mattresses DOM901 Comes supplied with two Julian Bowen Premier Mattresses Comes in a combination of Matt White and a Maple effect foil finish This moder..
Domino White Bunk Bed with two Premier Mattresses DOM902 Comes supplied with two Julian Bowen Premier Mattresses Comes in a Matt White coated foil finish This modern, neutral design will suit..
Childrens Beds - Julian Bowen Hornet Speeder Bed 90cm (3ft) HOR101Hornet Speeder Bed in gloss red lacquered finish. 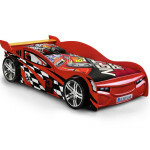 Race car detailingSupplied Flat PackedRequires Easy Self Assembly	Length: 201cmWi..
Childrens Beds - Julian Bowen Kimbo Blue Cabin Bed KIM002Comes in a Blue and Matt White finishMelamine edgingFeatures a Pull-out desk on castors, bookcase and 3 drawer chest of drawers which all fit n..
Childrens Beds - Julian Bowen Kimbo Pink Cabin Bed KIM001Comes in a Pink and Matt White finishMelamine edging	Features a Pull-out desk on castors, bookcase and 3 drawer chest of drawers which all fit..
Julian Bowen London Bus Bunk Bed in Red LON001	The iconic London Bus design transformed into a fun sleeping solution for any child's bedroom.MDF with red lacquered finishStrong fitted, powder coated..
Childrens Beds - Julian Bowen Scorpion Racer Bed in Red 90cm (3ft) SCO001Manufactured from MDF with a red high gloss lacquered finish.Race car detailingSolid Pine slats help create a sturdy and durab..
Childrens Beds - Julian Bowen Stella Low Sleeper Bed - Blue STE102A modern, space saving solution to any childrens bedroom with 2 underbed drawers on castors and useful shelving. 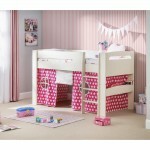 Offers Great Storag..
Childrens Beds - Julian Bowen Stella Low Sleeper Bed - Pink STE101A modern, space saving solution to any childrens bedroom with 2 underbed drawers on castors and useful shelving. 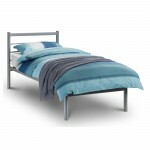 Offers Great Storag..
Julian Bowen Alpen 76cm (2ft6) Small Single Bed ALP004 Sturdy and durable metal bed Aluminium finish Width: 80cm Depth: 203cm Height: 91cm Mattress sold separately...see drop dow..
Julian Bowen Alpen 90cm (3ft) Single Bed ALP001 Sturdy and durable metal bed Aluminium finish Width: 95cm Depth: 203cm Height: 91cm Mattress sold separately...see drop down option fo..
Julian Bowen Amelia 90cm (3ft) Single Bed AME001 Amelia Stone White Bed A Classic Sleigh Bed in a Silky Stone White Lacquered Finish.﻿ Length: 208.5cm Width: 95.5cm Height: 102..
Julian Bowen Atlas Bunk Bed ATL001A sturdy metal bunk bed	Can be split into 2 single beds	Solid wooden ladder rungs and caps	Width: 96cm	Depth: 201cm	Height: 169cm	Please note for safety reas..
Julian Bowen Atlas Triple Sleeper Bunk Bed ATL003 A sturdy metal triple sleeper	Features a single 90cm bed on top and 135cm double bed on bottom	Incorporates solid wooden ladder rungs and caps	..
Julian Bowen Aztec 90cm (3ft) Single Bed AZT001 A sleek wood and metal bed Sprung base for added comfort and longer mattress life The bed is outstanding value for money Please note graph..
Julian Bowen Barcelona 90cm (3ft) Single Bed HFE BAR001 Contemporary Shaker style bed frame Made from solid pine and MDF High foot end Finished in a solid pine finish Width: 107cm ..
Julian Bowen Barcelona 90cm (3ft) Single Bed HFE BAR009 Contemporary Shaker style bed frame Made from solid pine and MDF High foot end Finished in a stone white Width: 107cm Dept..
Julian Bowen Barcelona 90cm (3ft) Single Bed LFE BAR003 Contemporary Shaker style bed frame Made from solid pine and MDF Low foot end (LFE) Finished in a solid pine finish Width: 107..
Julian Bowen Barcelona 90cm (3ft) Single Bed LFE BAR012 Contemporary Shaker style bed frame Made from solid pine and MDF Low foot end (LFE) Finished in a stone white Width: 10..
Julian Bowen Barcelona Bunk Bed BAR008 - PineThe Barcelona bunk is a very resilient bed, even for the most active of children.Constructed using a combination of sturdy solid pine and MDFAge Range 6 ye..
Julian Bowen Barcelona Hideaway Bed Pine BAR016 Contemporary Shaker style bed frame Made from solid pine and MDF In addition has a pull out bed that raises to the same level as the main bed f..
Julian Bowen Barcelona Hideaway Bed Stone White BAR017 Contemporary Shaker style bed frame Made from solid pine and MDF In addition has a pull out bed that raises to the same level as the ma..
Julian Bowen Barcelona Sleepstation UP10133 - Left Hand Ladder Comes with Pull-out desk, mini hanging wardrobe, 4 drawer and shelf unit which all fit neatly underneath the bed frame. 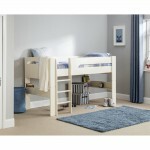 Offers great..
Julian Bowen Cameo White Sleepstation CAM011 - Left Hand Ladder Comes with Pull-out desk, mini hanging wardrobe, 4 drawer and shelf unit which all fit neatly underneath the bed frame. 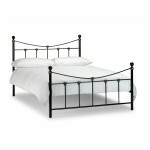 Offers gre..
Julian Bowen Chatsworth 90cm (3ft) Single Bed CHA001 A versatile metal bed that can fit both modern and traditional surroundings. 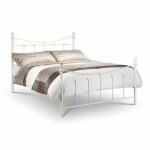 In a stunning Pearl Silver finish, the Chatsworth bed also featu..
Julian Bowen Chunky Bunk Bed 90cm UP10114 A solid pine bunk bed in an antique lacquered finish. 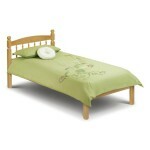 The Chunky bunk is a very resiliant bed, suitable for the most active of children. Width:..
Childrens Beds - Julian Bowen Cookie Cabin Bed 90cm (3ft) COO101 Cookie Cabin Bed in White and Charcoal Grey Finish. 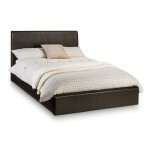 An innovative and highly functional cabin bed offering incredible versatility ..
Julian Bowen Cosmo 90cm (3ft) Single Bed COS001 Sturdy and durable metal bed The Cosmo Bed is upholstered in luxurious brown faux leather together with contrast stitching detail. 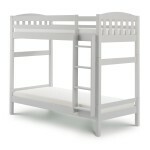 Incorporate..
Julian Bowen Domino Bunk Bed DOM001 - Maple and White Comes in a combination of Matt White and a Maple effect foil finish This modern, neutral design will suit both boys and girls r..
Julian Bowen Domino Bunk Bed DOM002 - White Comes in a Matt White coated foil finish This modern, neutral design will suit both boys and girls rooms making it very versatile. 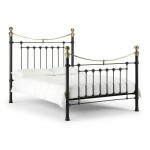 Age Range 6 years..
Julian Bowen Florence 90cm (3ft) Single Bed FLO011 Sturdy and durable metal bed The Florence bed is full of great classical detailing reminiscent of the great Vitorian era. 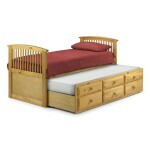 Finished in a stone..
Julian Bowen Hornblower Cabin Bed HOR001 - Pine Stylish antique pine cabin bed with a hidden secret of the guest bed below. 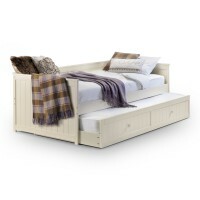 Single sized bed frame A pull out under bed gives extra sleeping ..
Julian Bowen Hornblower Cabin Bed HOR002 - Stone White Stylish stone white cabin bed with a hidden secret of the guest bed below. 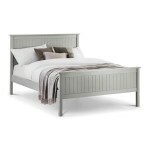 Single sized bed frame A pull out under bed gives extra sl..
Julian Bowen Jessica Day Bed 90cm (3ft) JES001 Stylish Jessica Day Bed with a stone white Laquered finish. 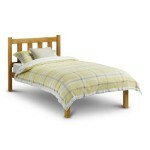 Single sized day bed A pull out under bed gives extra sleeping surface when required. 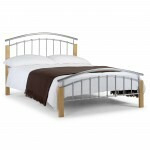 W..
Julian Bowen Katrina 90cm (3ft) Single Bed KAT001 The Katrina bed is a beautifully designed bed. 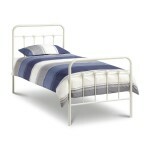 Made from metal making a sturdy, high quality bedstead. The stone white finish will bring a l..
Julian Bowen Leo Childrens Sleeper Bed LEO001 - Maple Contemporary Maple and Aluminium finish sleeper Offers Great Storage Comes in a Maple finish Separate desk on casters and a..
Julian Bowen Leo Childrens Sleeper Bed LEO002 - White Contemporary Maple and Aluminium finish sleeper Offers Great Storage Comes in a White finish Separate desk on casters and ample ..
Julian Bowen Papplewick 90cm (3ft) Single Bed PAP001 The Papplewick takes its design influence from the Victorian era. 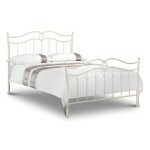 A true classic that offers a timeless look. 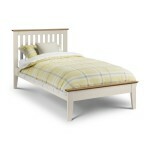 Finished in a stone white eg..
Julian Bowen Pickwick 90cm (3ft) Single Bed UP10113 The Pickwick collection is a timeless classic. 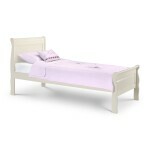 Crafted from solid pine and presented in a luxurious antique finish, the Pickwick is a truly ..
Childrens Beds - Julian Bowen Pluto Grey Midsleeper Bed 90cm (3ft) PLU101 Pluto Midsleeper is a sturdy and stylish mid-sleeper finished in a smooth dove grey lacquer. 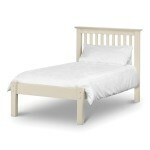 Also available with the optiona..
Childrens Beds - Julian Bowen Pluto White Midsleeper Bed 90cm (3ft) PLU001 Pluto Midsleeper is a sturdy and stylish mid-sleeper finished in a smooth stone white lacquer. 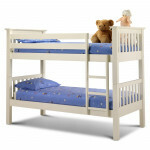 Also available with the o..
Childrens Beds - Julian Bowen Pluto Midsleeper Bed with Blue Star Tent 90cm (3ft) PLU001 PLU002 Pluto Midsleeper is a sturdy and stylish mid-sleeper finished in a smooth stone white lacquer. 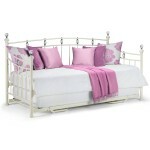 ..
Childrens Beds - Julian Bowen Pluto Midsleeper Bed with Pink Star Tent 90cm (3ft) PLU001 PLU003 Pluto Midsleeper is a sturdy and stylish mid-sleeper finished in a smooth stone white lacquer. 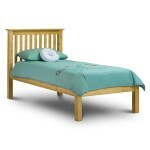 ..
Julian Bowen Poppy 90cm (3ft) Single Bed POP001 Poppy Bed in solid pine The Poppy Bed comes with a wooden slatted Base Length: 201.5cm Width: 100cm Height: 95cm ..
Julian Bowen Rebecca 90cm (3ft) Childrens Bed REB002An Elegant Satin Black Finished Metal Bed with Antique Gold Highlights. 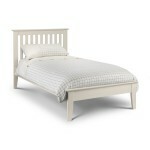 The sprung slatted base gives extra comfort and a longer mattress lifePleas..
Julian Bowen Rebecca 90cm (3ft) Childrens Bed REB004 An Elegant Stone White Finished Metal Bed The sprung slatted base gives extra comfort and a longer mattress life Please note that the main i..
Julian Bowen Salerno Shaker 90cm (3ft) Single Bed SAL107 - Ivory A Beautiful Ivory 90cm / 3ft Bed Salerno is a timeless shaker styled bed with refined detailing finished in a durable Ivory La..
Julian Bowen Salerno Shaker 90cm (3ft) Single Bed SAL101 - Oak A Beautiful Solid Oak 90cm / 3ft Bed Salerno is a timeless shaker styled bed with refined detailing constructed from solid Ameri..
Julian Bowen Salerno Shaker 90cm (3ft) Single Bed SAL104 - Two Tone A Beautiful Ivory and Oak 90cm / 3ft Single Bed Salerno is a timeless shaker styled bed with refined detailing finished in ..
Julian Bowen Victoria 90cm (3ft) Single Bed VIC004 Sturdy and durable metal bed A traditional, victorian inspired bedstead with brass embellishments. 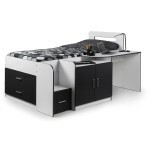 Available in either a satin black ..
Julian Bowen Wendy Sleeper Bed WEN002 WEN003 WEN005Solid pine sleeper with pull out desk, shelves and play tent. 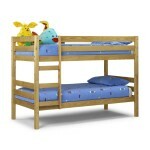 Play Tent available in Dark Blue WEN002 or Pink WEN005, as shown in graphics	Width: 1..
Julian Bowen Wyoming Pine Bunk Bed WYO001Solid pine bunk bed in an antique lacquered finish	Width: 203cm	Depth: 101.5cm	Height: 150cm	..
Childrens Beds - Julian Bowen Zodiac Bunk Bed 90cm (3ft) ZOD001 Bright White Lacquered Finish Supplied Flat Packed Requires Easy Self Assembly Length: 207cm Width: 103.. 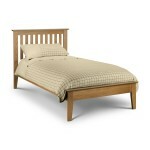 Single Bed - Phoenix Storage Bed 90cm (3ft) in Brown Faux Leather PHO108 The Phoenix Storage Bed is a fabulous ottoman bed, with a gas powered, lift up frame. 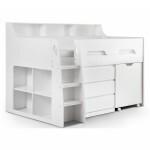 Fits a standard UK single mattress..
White Bunk Bed Barcelona BAR015 by Julian BowenThe Barcelona bunk is a very resilient bed, even for the most active of children.Stone white lacquered finishBunk bed available in stone white finish. 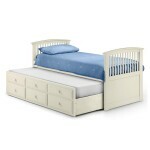 Al..
Julian Bowen Cameo Cotbed/Toddler Bed CAM020 A stone white lacquered, shaker style cotbed/toddler bed. 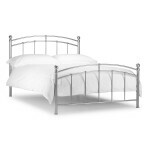 3 Adjustable Cot Mattress Heights Easily converts from Cot to Toddler Bed as your Chi..
Julian Bowen Maine 90cm (3ft) Grey Single Bed MAI008 A Dove Grey lacquered single bed Please Note: The Picture shown is of the Double Bed, unfortunately a picture of the single bed has not b..
Bunk Bed - Max Combination Childrens Bunk Bed MAX101 The Max Combination Bed is astonishingly adaptable and converts easily into SEVEN different sleeping options: 1. 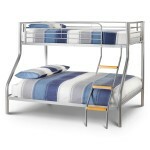 Bunk Bed 2..
Bunk Bed - Max Combination Childrens Bunk Bed MAX102The Max Combination Bed is astonishingly adaptable and converts easily into SEVEN different sleeping options:1. 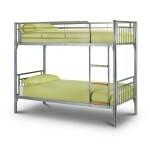 Bunk Bed2. 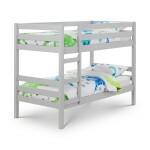 Mid-s..
Bunk Beds - Camden Bunk Bed Julian Bowen CAM501 Camden is a trendy dove grey coloured bunk bed with a robust construction from solid pine. 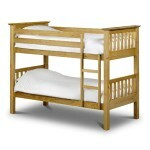 Its clean lines and timeless design offers a winning comb..
Bunk Beds - Orion Oak Bunk Bed Julian Bowen ORI001 Orion is a contemporary, innovative bunk bed presented in an on-trend Sonoma Oak finish. 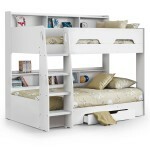 Orion combines style with great practicality and include..
Bunk Beds - Orion White Bunk Bed Julian Bowen ORI002 Orion is a contemporary, innovative bunk bed presented in an on-trend Pure White finish. 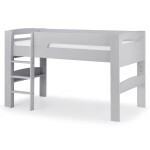 Orion combines style with great practicality and..
Childrens High Sleeper - Pegasus Anthracite High Sleeper Childrens Bed PEG005 The Pegasus High Sleeper is the ultimate in functional bedroom furniture for kids and teenagers. 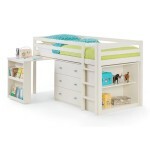 Finished in matt anth..
Childrens High Sleeper - Pegasus White High Sleeper Childrens Bed PEG001 The Pegasus High Sleeper is the ultimate in functional bedroom furniture for kids and teenagers. 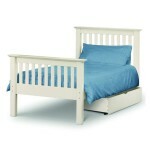 Finished in matt white wit..
Day Bed - Grace White Daybed Childrens Bed GRA001 Grace is a stunning pure white daybed which offers great functionality for both children's rooms and elsewhere. 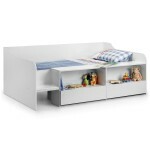 The sleek curved design inco..
Day Bed - Sophie Daybed Childrens Bed in White SOP201 The Sophie daybed offers stunning contemporary styling with great functionality. 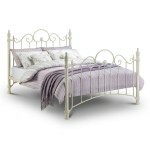 Exquisitely finished in stone white satin powder coating Luxurio.. 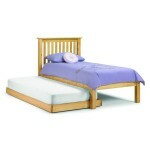 Kids Bed - Roxy Sleepstation Childrens Bed ROX101 Single Bed The Roxy Sleepstation is an extremely clever and practical piece of children's furniture that offers incredible functionality and great.. 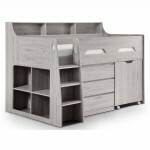 Kids Bed - Stella Low Sleeper Bed STE103 Childrens Bed A modern, space saving solution to any childrens bedroom with 2 underbed drawers on castors and useful shelving.﻿ Accepts a Standard UK Single M..
Julian Bowen Jupiter Mid Sleeper Bed in Grey Oak JUP102 The Jupiter Mid Sleeper is an ideal childrens bed for rooms with limited amounts of space Gorgeous grey oak finish Features a chest of drawers,..
Julian Bowen Jupiter Mid Sleeper Bed in White JUP101 The Jupiter Mid Sleeper is an ideal childrens bed for rooms with limited amounts of space Gorgeous all white finish Features a chest of drawers, p.. 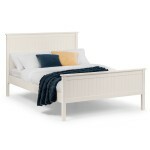 Single Beds - Maine White Single Bed MAI108 - 90cm, 3ftDurable Surf White Lacquered FinishTimeless and Classic DesignSolid Pine Slatted BaseNew England style panellingA sprung slatted base ensures sup.. 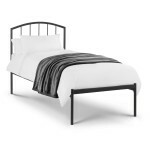 Single Beds - Onyx Single Bed Metal Bed ONY001 - 90cm, 3ftA clean, contemporary styled metal bed with simple detailing finished in a silky, satin grey finish.The refined, high-quality, durable welded ..